Thankyou - we are currently not accepting cross linking requests. We have a control system in place to show applicable Northern Territory releveant travel infomation only to our client. Ayers Rock (Uluru) is approximately 350 klm SW of Alice Springs central Austrailia in Northern Territory. The 3 main geological jewels in central Australia are Ayers Rock, 45klm away is Kata Tjuta (Olgas) and a further 230 Klm away is the striking Kings Canyon. On the way stop in at the camel farm from Uluru Ayers Rock or Alice Springs or a balloon ride in Alice Springs. Kakadu National Park approximately 230klm from Darwin in Northern Territory, Australia is one of the few World Heritage Areas that has been designated for it's natural and historical heritage. Top End:- This is a term to idtentify the areas such as Arnhemland, katherine, Litchfield, Darwin. many tours are named 'Top End Tour' which in clude kakadu, Litchfiled and or Kathine. Before Kakadu you can also visit the beautiful Litchfield National Park only 90klm from Darwin. Katherine is 332KLm straight down the highway from darwin with it's pristine Gorges. http://www.kakadunationalparkaustralia.com/ - Kakadu National Park an Australian Natural Icon covers almost 20,000 square kms and is 257 kms East of Darwin the capital city of the Northern Territory, Australia. Kakadu National Park is a World Heritage listed area that has been listed for it's cultural and natural heritage and Kakadu is the largest terrestrial national park in Australia. Life in the park does depends on the water, also in respect to the tropical monsoon climate that produces the downpours of the tropical humidity of the "wet" season, and the milder weather of the "dry" season. http://www.litchfieldnationalpark.com/ - Together with stunning tropical waterfalls and swimming holes, this is a truly beautiful destination found just south of Darwin, the capital city of the Northern Territory. Litchfield National Park features numerous waterfalls which cascade from a sandstone plateau called the Tabletop Range, monsoon rainforests, intriguing magnetic termite mounds and historical sites. Litchfield National Park is chosen by local Darwin residents and tourists as 1-3 day destination for it's waterfalls and magnetic termite mounds. Also noted are the 4WD tracks into some of the more remote parts of Litchfield National Park and surrounding region. http://www.tropicaldarwin.com/ - Darwin: The Capital city of Northern Territory, Australia is Darwin. Now Darwin is closer to Jakarta than to Sydney, and also closer to Singapore than to Melbourne. It is not really a suprise then that Darwinians looks to Asia for travel, influences in dress and food as much as it looks south to the rest of Australia. Darwin's proximity and relationship such as its sister city program with the Northern Territory's northern neighbours is reflected in Darwin's cosmopolitan and relaxed tropical atmosphere and culture. target=_blank www.australia4wheeldriverentals.com a traditional site display long specification travel information and photo's on Australia 4 Wheel Drive Rentals for 4WD & 4WD Campervan hire and selfdrive rentals from Darwin, Perth, Alice Springs, Brisbane, Cairns, Melbourne, Adelaide, Tasmania, Broome. www.australia4wdrentals.com - Now a live database with uptodate pricing for online searching for Australia 4 Wheel Drive Rentals for 4WD & 4WD Campervan hire and selfdrive rentals from Darwin, Perth, Alice Springs, Brisbane, Cairns, Melbourne, Adelaide, Tasmania, Broome. Please note these links are supplied only as a link for information our company has no affliation some of these links. Please note our site/company is not responsible for the contents of any link sites and is offered in goodfaith only. But Australia's Kakadu sees seasons of varied extremes -- so varied, in fact, that the park's longtime aboriginal inhabitants have divided the year into six distinct seasons. � Kakadu Seasons - Gunumeleng Pre-Monsoon Storm Season - Gunumeleng, from mid-October to late December, may in fact last from a few weeks to several months. � Kakadu Seasons - Gudjewg - Monsoon Season - Gudjewg, from January to March, can be described as the 'true' wet season. � Kakadu Seasons - Banggereng - Knock 'em down storm Season - Banggerreng, in April, is the season when the rain clouds have dispersed and clear skies prevail. � Kakadu Seasons - Yegge - Cooler but still humid Season - Yegge, from May to mid-June, is relatively cool with low humidity. � Kakadu Seasons - Wurrgeng - Cold Weather Season - Wurrgeng, from mid-June to mid-August, is the 'cold weather' time; humidity is low, daytime temperatures are around 30�C and night-time temperatures are around 17�C. � Kakadu Seasons - Gurrung - Hot Dry Weather - Gurrung, from mid-August to mid-October, is hot and dry. Please note some of these links are supplied only as a link for information our company has no affliation some of these links. Important; This site is for the beneift of those researching for their next vacation to Australia including Uluru and the MacDonnell Ranges, The road from Alice Springs to Darwin, Litchfield National Park, Kakadu National Park in Northern Territory also know as the 'Top End and the Kimberley in Western Australia '. Accommodation hotels, motels, bed and breakfast and tourist van parks. Tours Kakadu, Darwin, Katherine, Litchfield, Uluru Ayers Rock and Northern Territory. 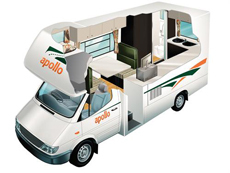 Search online for current availability and best prices and book now As a proudly Australian, family owned motor home company, Apollo strives to exceed your expectations with our award winning service and quality for motorhome hire whilst keeping cheap prices. 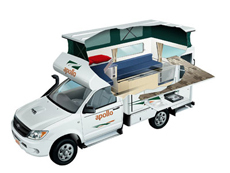 As the largest privately owned recreational vehicle operator in the Southern Hemisphere, you can rest assured that you are travelling with the best when you choose Apollo for your RV holiday. 2 Berth - The compact Adventure Camper is perfect for those interested in a real outback adventure. Far roomier than similar vehicles, this 4WD campervan is ideal for thrill seeking couples. The extra fuel capacity means you can travel for longer without having to stop and the indoor and outdoor cooking facilities allows you to enjoy a dinner under the stars or in the cosy camper. Our unique Outback Camper is perfect for off-road family adventures. Special features such as indoor cooking facilities, external shower and a large retractable awning will help make your family road trip one to remember. If the safety of your children is paramount this vehicle offers greater security as it is one of the few 4WD vehicles here the whole family can sleep in the secure cabin. 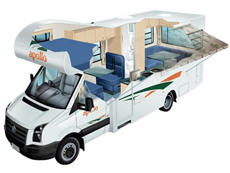 Our top of the range deluxe campervan is equipped with inclusions of a motorhome at an even more affordable price. Features include heated/air conditioned cabin and living area, shower and toilet, large double bed and fully equipped kitchen including microwave, gas stove and refrigerator. All aboard the Euro Camper! The vehicle�s turbo engine and power steering ensure easy handling and a smooth ride. 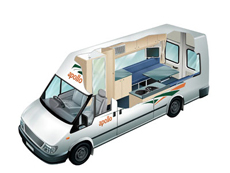 The layout, allows easy access to all the Euro Camper�s quality features. Walk-through access, TV/DVD player and the passenger seats close to driver's cabin.